A local oil & filter change shop told me I needed a new alternator belt, because the current one is cracked. They told me this when the car had 90,000 miles on it, it now has 91,000 miles on it. It is a 2008 Yaris, base model hatchback. It would have cost quite a bit to have them replace the belt, $80-$100. The belt is a serpentine belt. I looked at it and felt it with my hand as much as I could and I cannot really say it is cracked or worn, but I am not an expert at all. QUESTIONS: Is it likely the belt is worn enough to need replacing? Can I assess the wear of the belt myself? Am I taking a great risk if I do not replace the belt right away? How hard would it be for me to replace the belt myself? It is sometimes difficult to assess the condition of the belt because wear can be invisible as the ribs in the belt become uniformly worn. If there isn't a lot of squealing or if there aren't obvious chunks missing or fraying on the belt, then it is likely not at risk of breaking soon. Replacing the belt is a very easy job. A good quality belt can be had for around $10.00 US from Rock Auto. 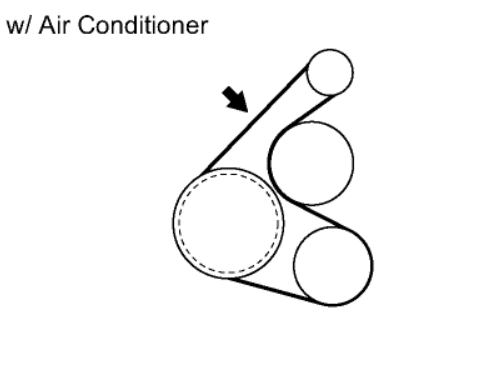 Below is a belt routing diagram for a Yaris with A/C. Also a couple video links to replacing the belt. I haven't watched the videos myself. Because the Yaris has a manual belt tensioner, pay close attention to those parts of the videos. Last edited by 06YarisRS; 11-07-2017 at 07:24 AM. Just something to consider... That belt runs the water pump too, so if it breaks, you'll have about a minute before the engine starts to overheat. If that belt has 91k on it, I Would change it. Crack or no crack. Mine shown sign of cracks/dry rot at 74k miles. So yeah, change it before it breaks. Be aware that the procedure on the videos is valid for certain engines only. My 64kW 2SZ-FE is different. The alternator is accessible from below the car only and there must be a way to "loosen" the entire engine a bit because there is no chance to get the belt out just by loosening the alternator - there are still obstacles that prevent the belt from being taken out. If its glazed and has deep cracks on the ribs it needs to be changed. The best belts I found for this car are the OEM. You dont have to buy it from toyota. Bando makes the OEM and its alot cheaper.You can find it on rockauto and amazon. There are two sizes, one for ac, and one without. Its very easy to change. There is a 12mm bolt, and 14mm on the bottom. Since there is no tensioner, you have to get a pry bar to tighten it while putting tension on it. Pretty easy job. You can look up which belt your cars uses on bando belts website. Thanks to everybody. I looked at the diagram that 06YarisRS sent and then felt around for the belt and I think I can feel pretty well where the belt goes. One of my fears is that i will get the old belt off and then not be able to put the new one on, because I will not be able to figure out how it winds around the various pulleys. But after looking at the diagram, and feeling around I don't think it will be that much of a problem. 06YarisRS said: "Because the Yaris has a manual belt tensioner, pay close attention to those parts of the videos." Is there some kind of belt tensioner tool that I need? xdarkxfirex said: " Since there is no tensioner, you have to get a pry bar to tighten it while putting tension on it." What kind of pry bar do I need? xdarkxfirex said: "If its glazed and has deep cracks on the ribs it needs to be changed." What do you mean by glazed? The top of the belt (without the ribs) seems pretty smooth. And how is it possible to look at the ribs for cracks, since the ribs are on the inside of the belt? +1. I have had excellent results with Bando belts. There are a couple Bando belts available at Rock Auto and pricing is very good. I found a receipt in the glove box of the 08 that I just bought. The previous owner had the belt replaced at Canadian Tire. $95.00 plus tax!!! Even after the belt install, it was squealing. The owner then sprayed belt dressing on it and made the problem worse. I ordered a new belt and will replace it this week. It's not squeaking now as I blasted everything with parts cleaner to get rid of the dressing and clean the pulleys up. On my 06 Yaris, I replaced the alternator and was amazed at how simple the belt install was. My Kia Sedona, on which I also replaced the alternator, had a much more difficult belt routing as did my Dodge Grand Caravan. Go for it! You can do this job for probably around $15.00, save a ton of money and feel satisfied that you did it yourself. No special tool is needed, just a ratchet, socket and some kind of prying device. I used a crow bar. Rant: Most shops will quote you a book time to complete the job which is often grossly inflated. It is an averaged time. The same job on one vehicle may be quick (not rusted fasteners etc) or it may take longer. Either way you pay the same. Actually if it takes longer than the suggested book time, they may well try to charge you more. Independent shops may quote a more fair price. Replacement of one of these belts should really be a 5 minute job. To illustrate, I was quoted 0.5 hours per side (2 sides) to replace the sway bar bushings in my Dodge (I did this annually as it is a design flaw that causes the bushings to go out of round and the sway bar clunks) and I have OCD related to having a quiet car. My best time for replacement was 13 minutes for both sides. Cost to replace at the shop: ~$90.00 (labour) + ~$30.00 (parts) + ~$10.00 ("shop supplies") + ~$19.50 (tax) = ~$149.50. DIY: $12.00 for OEM bushings from Ebay. It's all about the psychology. You drive in to a shop and your vehicle is clunking. You drive out and it's nice a quiet. "Hey, what's $149.00? That was cheap. It could have been a lot more." Go DIY, save a fortune, get to know your vehicle and feel good! Plus, you get well-deserved bragging rights. Last edited by 06YarisRS; 11-08-2017 at 06:43 AM. Go to the Gates website and order their belt wear checker, a very simple device. And free. Also you can read their theories about belts and belt wear and replacement. Thanks to everybody, especially you 06YarisRS. Before my last post, I had checked the belt in the dark under street lights. But I have since checked the belt during the day and feel even more confident. So I think I will go ahead and do it myself. I also felt for breaks in the belt ribs and cracks along the edge of the belt and there were none I could feel or see. I may wait for 3-5 months until the weather improves, as I do not have a garage. I did order the gauge from Gates at http://www.gates.com/products/automo...elt-wear-gauge . Has anybody used this gauge? Is it accurate? I haven’t got mine yet and I ordered it at the beginning of October. I hope I get one! Thanks Bronsin, I guess it takes 6-8 weeks to get the gauge. The belt gauge does work for belt wear but doesn't show belt cracking. Cracking is caused by age and heat. To see if the belt is cracked you have to flip it over with your fingers to see the ribbed part. Most of the time a belt will crack out before it wears out. To be honest these belts are so cheap and so easy to put on it is a no brainer to just replace it regularly. Especially if you live in or drive through areas with extreme climate, like the desert. I change mine 50k as a matter of habit on all the vehicles I have had. Then just throw the old one in your spare tire area as a emergency spare belt. Belts are wear items just like your oil or air filters. I bought a new one for my Yaris right after I got the car even if it didn't strictly need it. Stay ahead of the curve. Last edited by scylla; 11-11-2017 at 06:05 PM. About 10days ago, I noticed that the belt was screeching for about 2 seconds sometimes when I first started the car. So I ordered a new belt from Rock Auto. I installed a new belt about 5 days ago and everything went well. I followed the instructions in the videos at the links posted by 06YarisRS above. I slid a pipe over the handle of my ratchet wrench handle to get extra leverage when loosening the bolt the alternator pivots on. This was recommended in one of the videos (they used a "shotgun barrel" rather than a pipe). I used a magic marker pen to mark the metal slot that the top alternator bolt slides in. I used a pry bar (as suggested above) to tighten the new belt by returning the top alternator bolt to the place marked on the slot. THERE IS ONE REMAINING PROBLEM, HOWEVER. I notice now that the belt is still screeching for about 2 seconds sometimes when I first start the car. What should I do about this screeching? Should I try tightening the belt even further? Last edited by RMcG; 04-25-2018 at 08:01 PM.